Martial Eagle. This guy has a wingspan of 2.9m and this makes it large enough to kill baby Impala, baboons and vervet monkeys. 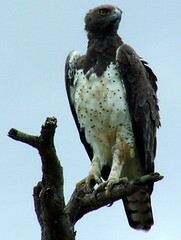 To be a part of a birding / photographic tour / safari, please visit www.atlarge.co.za and see what we have on offer. You can also join our forum pages for free to see more info on animals, birds and our special offers. Entschuldigung fur meine Deutsch, ich redene nicht jeden Tag diese Sprache. Hier gibt es ein Kampfadler. Er hat ein Spanneweit von 2.9m und er frisst Affen wie Meerkatzen und auch kleinere Vogeln.